Standard resistance training machines are of limited use for functional training because their fixed patterns rarely mimic natural movements, and they focus the effort on a single muscle group, rather than engaging the stabilizers and peripheral muscles. The Body-Solid Pro•Dual Adjustable Cable Column is extremely useful for functional training because it allows you to recruit all major muscle groups while moving in multiple planes. We are dedicatedto manufacturing commercial-rated equipment that stands up to the demands of your facility, the expectations of your people and the rigors of daily use. We are focusedon designing equipment that adapts to fit the size and space requirements of a broad range of commercial facilities. 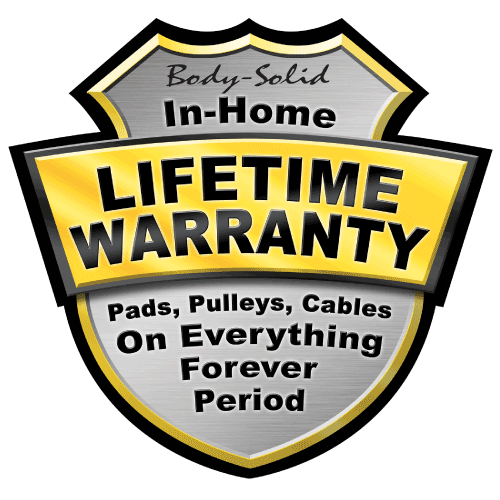 We are committed to providing our customers with the best lifetime warranty in the industry.